Thanks to Heather for sharing this timely quote! I often say, “I teach children – not the curriculum, program or standard”. I can’t remember where I first heard this statement, but I love it and I truly believe this. My children – the ones I’m teaching RIGHT NOW – are first and foremost in my mind as I plan, set up invitations and provocations and determine the next steps in my instruction. I use a wide variety of resources provided by the state, my county, my school, my colleagues and my own professional library – but I believe they are resources, not a prescribed script to follow. My plans are constantly changing and evolving, in response to the five and six year olds in my classroom. This doesn’t mean that I wing it. Not at all! I spend a lot of time planning the framework of our day, looking at individual students and where they are in their ZPD and making instructional decisions based on my research, beliefs and philosophy of how children learn. But I don’t consider myself a “Responsive Classroom” teacher or a “Units of Study” teacher. You will see much of the philosophy of Responsive Classroom because I believe in a constructivist approach and that the social curriculum is at the heart of what we do; you will see a balanced literacy approach and you will see Writer’s Workshop and Reader’s Workshop because I believe (and have believed and taught this way for 24 years) in a framework of time, choice and response. But within that framework, every year looks a little different – based on the kids in our room that year. It’s kind of like building a house. The framework stays the same on most houses, but what’s inside is different depending on who lives there. The framework of my teaching is the same – a workshop approach, balanced literacy approach, constructivist, inquiry-based learning – but the details of how it looks each year is different, based on who lives in our classroom that year. I worry that in today’s climate of one-size-fits-all instruction, with increasing kits, units and books that pre-plan lessons down to the minute being hailed as the “answer” to educational problems, that teachers aren’t being challenged to think. Are we reading the script or lesson that another teacher used with her kids, blindly following what “the experts” say to do? Or are we reading the lessons carefully, reflecting on how it will work in our classroom, with our students, discussing and collaborating with colleagues about the lessons, and then planning a lesson that we own, along with our current students? I hope we are. I hope we are trusting ourselves and supporting each other. And I hope our schools are providing the time and support for all teachers, and especially our new teachers, to think deeply about instruction. We can’t stop thinking, reflecting, questioning and challenging our own best teaching – and the resources we use. And we can’t forget that we teach children – not a curriculum. A project coming to life in Writer’s Workshop. How do you encourage and celebrate thinking in your classroom? Recently someone asked me, “What kinds of things do you do in summer to get ready for the upcoming school year?” I referred the person to Katie because I assumed the question meant “ideas for setting up your classroom or other things related to your organization, management, or curriculum for the next class of kids.” Since I am no longer working full time in a school my first reaction was that I had no thoughts on the matter. But over the past few weeks, I’ve come to realize that I do plenty in the summer to plan for the next year. 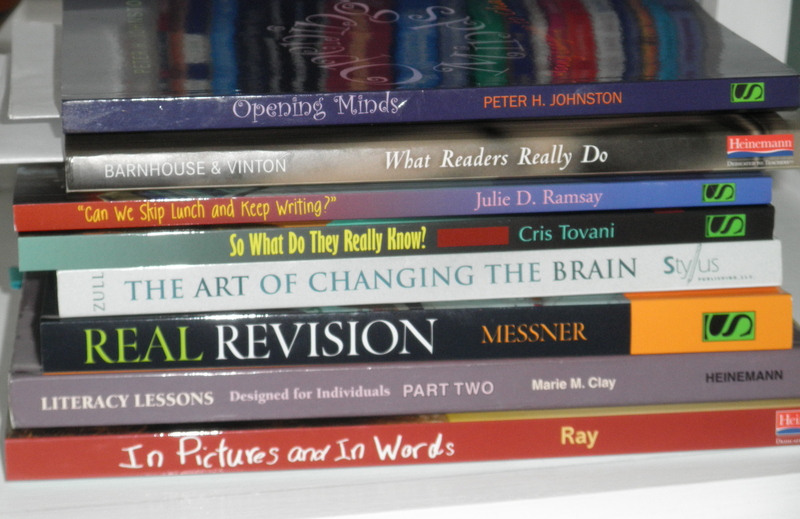 As a literacy consultant who does staff development with groups of teachers and as a volunteer who works in a school to support kids and teachers, I spend lots of time thinking, reading, rethinking, layering my knowledge base, and sometimes shifting my ideas about teaching reading, supporting children who struggle, and guiding teachers toward new understandings. One way I do this is to read, read, read in the summer. I read blog posts, professional books, children’s literature, and various articles referred to by colleagues on Twitter. 2. I’ve also spent hours thinking about Barnhouse and Vinton’s idea of back door teaching — not naming a strategy for the students until they have actually experienced using it as they negotiate a text together (from What Readers Really Do.) Take character traits, for example. How many times have we asked kids to name a trait of a particular character? They often say, “she’s nice” or “not nice.” To help them with better word choice, we’ve often brainstormed a list of traits for the kids to choose from and then ask them to provide evidence of why they think that trait applies. But Barnhouse/Vinton say we should help kids start with what’s in the text. Help them learn to read carefully and notice what the character does or says. Then ask, “what kind of person acts like that?” By doing this together, the students have actually done some inferring. But there is no need to begin the lesson by defining or identifying “inferring” as a useful strategy. Always begin with meaning making. 3. While reading an article by Franki Sibberson in Choice Literacy, I got excited to share her ideas for setting up an upper elementary classroom with interactive wall displays. She suggests a board with pictures of book characters, another with interesting/fun facts, graphs, surveys, or images; another display with word play ideas, and yet another with websites worth visiting. She says, “Like a museum, I want the room to be filled with invitations and possibilities, with something for everyone.” I can see the kids in that room having so much to talk about and share while browsing the walls in the first few days. 4. From my reading of children’s lit, I am recommending several of my favorite chapter books to read aloud to 4th and 5th grades this year: One for the Murphys, How to Steal a Dog, and The One and Only Ivan. Today I’m heading to a book store to look for Wonder because I loved what Katherine Sokolowski wrote about it in this week’s Choice Literacy. What have you been thinking a lot about this summer? Are you changing anything next school year because of something you read or heard this summer? One thing I do during an interactive read aloud is have kids “be the character”. I stop at a point in the text where the character is feeling an emotion or anticipating an upcoming event. I ask the kids to “pull out their masks” (I model pulling out an imaginary mask from my sock.) and put on their mask to be the character. I look to see them show what the character is feeling on their faces. Then I invite children who want to “be the character” to say what they are thinking or feeling (as the character). After we’ve shared briefly, I tell them to put their masks away (they put them back in their sock as a signal to come back to focus on the book) and we continue reading the book. I’ve always thought this was a great way for me to teach inferring, engage children with the characters and events in the book, to predict and to show how readers read beyond the text. After reading Peter Johnston’s, Opening Minds (Chapter 6), I now see that having children imagine that they are experiencing another’s feelings or emotions is much bigger than all of that. It is also a key component in building social imagination. Much of what happens in texts, personal interactions, academics and the “real world” happens inside our heads. Teaching children to imagine what is going on “behind the scenes”, in essence, is a highly important task. And how can we neglect this? As Johnston says, “social imagination is the foundation of civil society.” Children (and adults) need to be able to understand what others are feeling, to read people’s faces and expressions, to imagine different perspectives, to make sense of abstract ideas, and to reason through this. While social imagination may not show up in a list of state standards, it’s a critical piece of education that we cannot leave out. I’m looking forward to exploring this more in the upcoming school year. I see possibility in using this as we role-play problems that may arise in the classroom, as we read a variety of texts and as we interact with each other in the classroom. 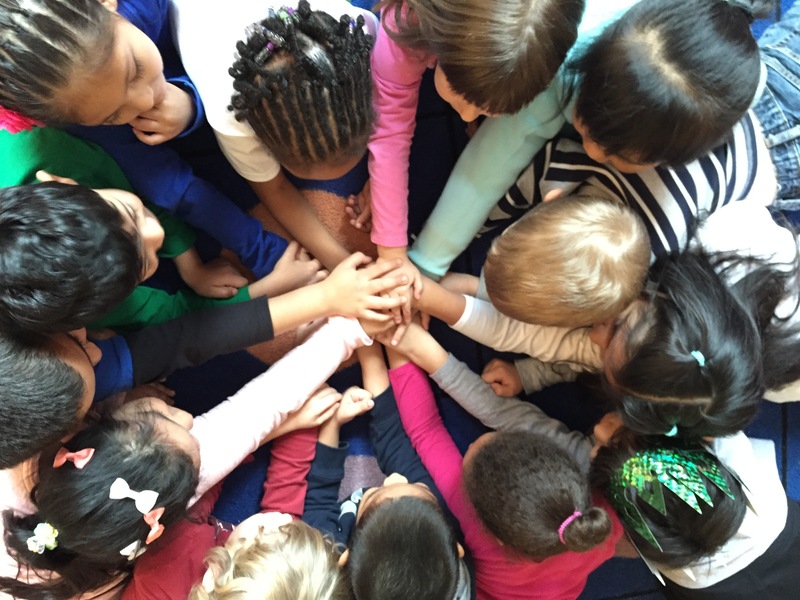 Kindergarten isn’t too early to start teaching children to look at multiple perspectives, to imagine alternate possibilities and to develop empathy. If we start there and continue building on throughout the school years imagine what kind of future we might have. How do you build social imagination & social reasoning in your classroom? Where have all the thinkers gone? So I’ve been thinking a lot about teaching lately. I tend to spend the first several weeks of summer reflecting on the past year, looking towards the upcoming year and asking myself what worked and what didn’t. I go for long runs and bike rides and think about my teaching. I surround myself with other thinkers in my life – people who are constantly asking themselves “why?”, questioning, wondering and reflecting on their own best practices. Twitter and blogs provide another place to think and read about what other educators are thinking, and allow me to question, wonder and grow as a learner. I can’t imagine teaching any other way. But I’m worried. I hear a lot of the conversations in the teaching world revolving around a “tell me what to do” mentality. I’ve talked with teachers who define their literacy or math block as, “whatever the teaching manual says to do that day”. But where are the students in this plan? We expect a teacher’s guide, a pacing guide, a list of test items and a copy of the standards and we think we’re good to go. This is what much of education has been reduced to. It’s the only way that many teachers know. While all of these things are important tools to have, I think educators have to be thinkers. We can’t let other people do our thinking for us. We are the ones who know our students and who must be responsive to what our students do each and every day. A pacing guide or teacher’s manual can’t possibly do this. I was at an inservice once for a basal reading series and I was asking several questions about how this “one size fits all” program could possibly reach the needs of my students. I was doing some serious thinking and questioning about the program our county was adopting. The presenter told me, “look, it’s all right here in the teacher’s manual – even your teachable moments. You don’t even have to think!” I told him that when I stopped thinking, I would stop teaching. In this era of standardized testing and accountability it’s even more important for us to be thinkers and to teach our students to be thinkers. While a bubble test does have a correct answer, much of life does not have a correct answer. It requires problem solving, reflecting, questioning, wondering and lots of thinking. I want my students to be curious and thoughtful, to wonder and ask “why” as much as they can. I want to model this by challenging (professionally, of course) questionable practices or curriculum mandates that I don’t feel are in the best interests of our students. I need to be current on best practices and solid research to support my questions and be ready to propose an alternative plan. I need to be constantly thinking and learning. Not only for me, but for all the students I teach every day. So how do you describe yourself ? 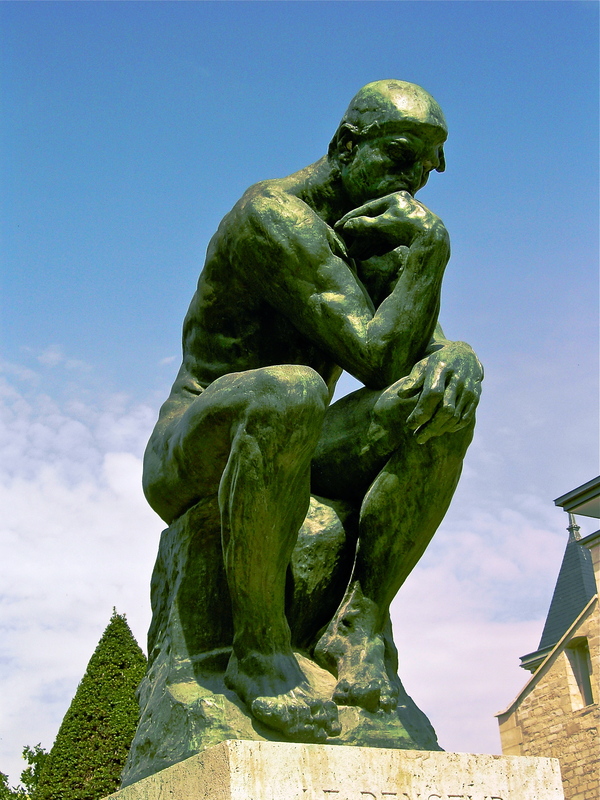 Are you a thinker or someone who reflects on his or her teaching? Do you question what is asked of you if you feel that it may not be what’s best for students? I hope teachers are resting up this summer, reflecting on their teaching and getting ready to make next year a fabulous teaching and THINKING year! What have you been thinking about this summer? We’d love to hear your thoughts!